Student Loan Rates Fixed by Congress and President. United Federal Credit Union Leads Consumer Lending in Michigan and Arkansas. Consumer Credit Use Rises During Summer, But Modestly. Princeton Federal Credit Union Supports Consumers in Central New Jersey. Student Loan Rate Finally Fixed by Congress and President. President Barack Obama signed a bipartisan bill to reform the federal government’s student loan system following the July 1 expiration of some loan subsidies and a resulting month-long legislative battle in Congress. The law sets student loan interest rates to the 10-year U.S. Treasury note instead of using the current arbitrary formula. It will also establish interest rate ceilings and lock interest rates for the loan’s lifetime. 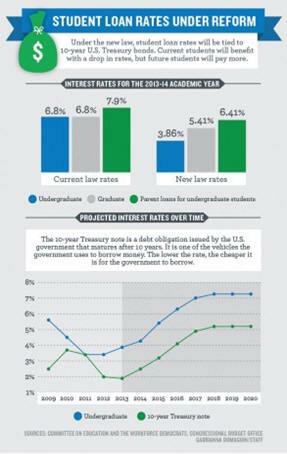 In the process, interest rates will be slashed for the upcoming 2013-14 academic year, with undergraduate rates reduced from 6.8 percent to 3.86 percent. The law will also retro-actively apply to loans taken out after July 1, when interest rates on federal Stafford loans doubled after Congress failed to prevent the expiration of subsidies. Stafford loan interest rates subsequently doubled from 3.4 percent to 6.8 percent. The legislation is projected to provide $25 billion in debt relief for students in the next five years. Thomas Hinton, president of the American Consumer Council, said, “This bill offers students and their parents a long-term solution to financing college and will ensure that thousands of students can now focus on their educational goals instead of how to pay for it.” When asked about the student debt crisis and its impact on student-consumers, Hinton stated, “The burden of student debt is a significant problem for students and their parents. We continue to support a ten-year tax credit equal to 75% of a student’s tuition costs. This will allow students to write-off a substantial amount of their college tuition into their early 30s – when their earning years really begin. It also allows students the freedom to choose among community colleges, state universities or a private university where tuition is much higher.” “In the long term, accounting for inflation, loans will become more expensive for prospective Berkeley students,” said Rachelle Feldman, director of the UC Berkeley Financial Aid and Scholarships Office. She suggested variable interest-rate loans and income-sensitive repayment programs as changes to the student aid program, as they would better adapt to changing economic conditions. Undergraduate loans for the coming year will drop to 3.86 percent, and graduate student rates will be 5.41 percent. 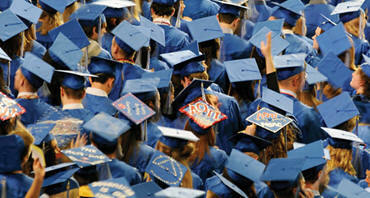 PLUS loans, which are offered to graduate students and the parents of undergraduates, will drop to 6.41 percent. All of these rates will be lower than the current fixed rates of 6.8 percent for Stafford loans and 7.9 percent for PLUS loans. The bill will also establish rate caps to prevent student loans from becoming too expensive — 8.25 percent for undergraduates, 9.5 percent for graduate students and 10.5 percent for PLUS loans. United Federal Credit Union gives consumers so many options. As a member of the American Consumer Council, you can join United FCU and avoid paying high fees and other charges normally charged by banks. So, consider the benefits of switching you accounts to a member-owned credit union that values you as a person and a customer. Visit www.unitedfcu.org or call 888-982-1400 to open your account today! You have so many options, why bank at United Federal Credit Union? Simply put, no one can offer the combination of products, convenience and outstanding member service that United FCU provides for our members every day. And the fact that we’ve been doing this for over 60 years means that we’re not planning on changing. United FCU is literally one of the strongest financial institutions in the country. While other institutions were receiving bailout funds, we continued to grow. Our sound lending and deposit strategies have kept us as strong as ever, even during the recent economic downturn. 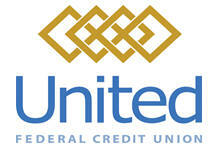 United Federal Credit Union (UFCU) has served its Members since 1949 by helping them build a sound financial future. UFCU consists of more than 120,000 Member/owners worldwide, and manages assets in excess of $1.57 billion. Its corporate offices and main branch are located in St. Joseph, Michigan with additional branches in Arkansas, Indiana, Michigan, North Carolina, Nevada, and Ohio. 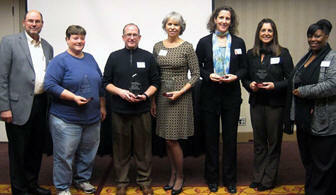 UFCU has been named the Michigan Credit Union League Outstanding Credit Union of the Year 2013. UFCU has also been named the National Federal Credit Union of the Year 2013 by the National Association of Federal Credit Unions. Our primary purpose is to serve you, our member/owners, not the bottom line. 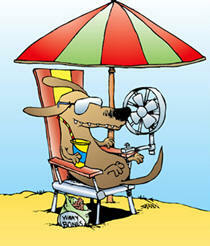 When you are a member, you're an owner -- that's the credit union difference! 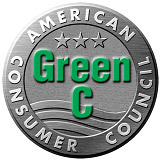 As a member of the American Consumer Council you are eligible for membership. Simply go to www.unitedfcu.com and apply online; or, call our Member Service Center at 888-982-1400. We look forward to serving you! United Federal Credit Union Breaks Ground on a New Full-Service Fletcher, North Carolina Branch to Serve Area Residents. On Wednesday, July 17, 2013, United Federal Credit Union broke ground on a new 6,400-square foot branch at 3674 Hendersonville Road, Fletcher, NC. When complete, the $1.5-million project will offer Fletcher residents added convenience and more banking choices. The new and enhanced facility will be full-service, including multiple drive-thru lanes, an ATM, safe deposit boxes, an expanded Member Service area, and a community meeting room. It will employ nine initially, including staff from the location. “The new branch will also offer the services of a mortgage loan officer and business service advisor in one convenient location,” said UFCU Vice President of Member Relations/North Carolina Lee Beason. 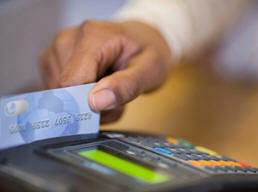 Consumer Credit Use Rises, But Modestly. Consumer credit rose a seasonally adjusted 6% or $13.8 billion in June for a total of $2.8 trillion borrowed during the month, according to the Federal Reserve's Consumer Credit report. Money borrowed from credit unions totaled $251.5 billion. The overall credit increase is less than the $15 billion expected by economists polled by Reuters (Aug. 7). Consumers took out loans for items such as cars and education, but used their credit cards more frugally. At credit unions, borrowing increased by $2.6 billion from the $248.8 billion borrowed in May. That compares with $231.2 billion in the second quarter of last year, said the report. Revolving credit, which includes credit card spending, decreased in June by 3.8% or $2.7 billion to $853.6 billion. That compares with $856.3 billion in May and $844.3 billion during second quarter of 2012. Credit unions' revolving credit increased slightly to $40.1 billion, from $39.8 billion in May and $37.4 billion in second quarter 2012. Non-revolving credit--such as loans for cars, mobile homes and college tuition--rose 7.5% or $16.5 billion to $1.99 trillion in June. That compares with $1.98 trillion in May and $1.85 trillion during second quarter of last year. Credit unions loaned out $211.4 billion in non-revolving loans in June, an increase over $209.2 billion in May and $193.8 billion in second quarter 2012. The New Jersey Consumer council welcomes Princeton Federal Credit Union as a Sponsoring Member. Princeton Federal Credit Union was originally chartered in 1972, by the faculty and staff of Princeton University. We are financially sound and continue to grow and serve almost 8000 members from over 60 Select Employer Groups (SEGs). The credit union concept originated in Germany during the mid-1800s. A group of farmers tired of high prices and outrageous interest rates combined their money to buy supplies and establish a common pool to borrow from at lower interest rates. Although credit unions have changed over the years to meet the demands of their members, a long-standing philosophy of "People Helping People" has remained the same. Princeton Federal Credit Union is dedicated to providing quality service, financial solutions and value, while building trusted relationships for a lifetime. As a member of the New Jersey Consumer council you may be eligible to join Princeton Federal Credit Union. Also, you may open a Savings Account at Princeton Federal Credit Union if you are employed by any of our Select Employer Groups (SEGs), or if someone in your immediate family or household is currently a member of the Credit Union. An immediate family member includes a spouse, child, parent, brother or sister, grandparent or grandchild. Once you open a Savings Account (and become a member), you are able to take advantage of all of the services offered at the Credit Union. Again, anyone within your immediate family or household is also eligible for credit union membership. If your company or organization would like to increase its credibility with consumers, you should consider applying for the Green CSM Certification. Applications for the 2013 Fall cycle are now being accepted through November 30, 2013.